Type Ia supernovae are extraordinary useful for astronomical distance measurements thanks to their extreme and standard brightnesses, and were even used in the Nobel Prize winning discovery of the acceleration of the expansion of the universe. Yet despite their prevalence in astronomy research, the origins of these explosions – the progenitors – are not well understood. In a new paper by Wang et al. to appear in Science, the authors present evidence of two distinct populations: those with high velocity ejecta and those with normal velocity ejecta. The authors find that these two populations originate from different locations within galaxies, and likely come from different populations of stars. 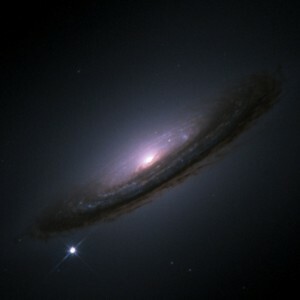 Type Ia Supernovae are a particular class of supernovae that do not originate from the collapse of a massive star. Instead, these supernovae are thought to occur from thermonuclear explosions of white dwarfs in binary systems. The white dwarf accretes mass from the binary companion until it reaches the Chandrasekhar mass limit – the maximum mass at which a degenerate white dwarf will be stable. After the mass surpasses this limit, the white dwarf explodes. This is why type Ia supernovae have constant luminosities – they come from explosions of white dwarfs with the same initial mass. As discussed in this astrobite, the exploding star is likely a white dwarf, but there is some debate about the binary companion. Initially the binary companion was thought to be a red giant because mass loss would be easy from its puffed up outer envelope. Now astronomers have theorized that the companion could be a main sequence star, a sub-giant, giant, or even another white dwarf. While type Ia supernovae are all quite similar to each other, they are not exactly identical. Of particular interest to the authors is the velocity of the ejecta. This is found by looking at the exact wavelength position of particular spectral lines, in this case the ionized silicon line. The faster the ejecta is moving, the more blueshifted the line will be. The differences in velocity could just be a geometrical effect, i.e. the differences are only caused by different viewing angles. If the different supernovae originate from the same initial population, just viewed from different angles, then all the supernovae should have the same radial distribution in their host galaxies. This is the hypothesis that Wang et al. set out to test. Wang et al. used a sample of 188 type Ia supernovae and split them into two groups: those with normal velocity ejecta (<12,000 km/s) and those with high velocity ejecta (>12,000 km/s). Next, they estimated the location of the supernovae in their host galaxies. This is trickier than it sounds because they are viewing three-dimensional objects projected in two-dimensions on the sky. 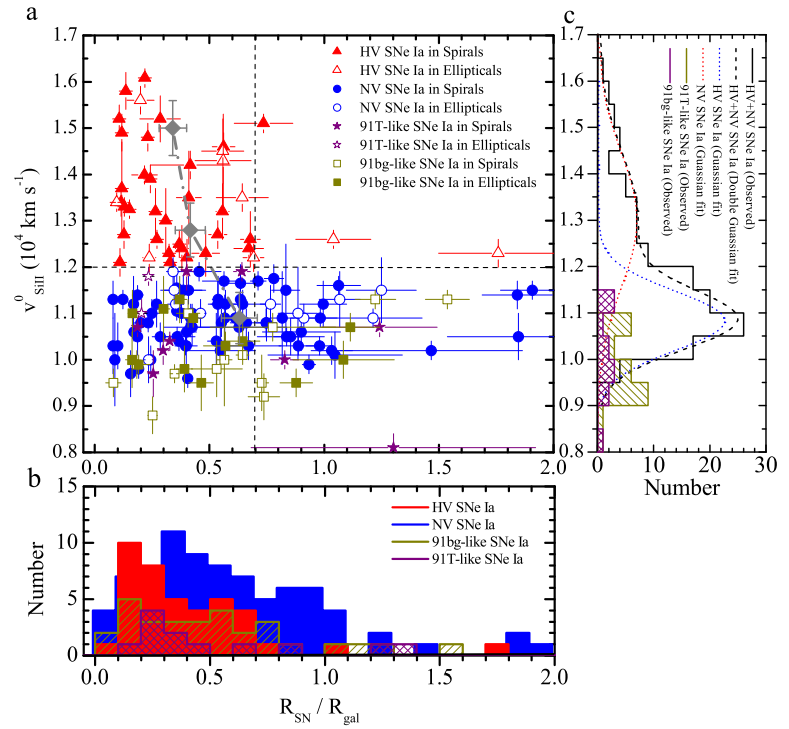 For supernovae in spiral galaxies, Wang et al. had to correct for the tilt of the galaxy. If the galaxy is assumed to be a flat circular disk, then the tilt with respect to the observer makes the galaxy look like an ellipse. The ratio between the major and minor axes of the ellipse is a direct proxy for the tilt, and is used to correct the distances in spiral galaxies. Elliptical galaxies are spheroidal, and do not need this correction. Radial distribution of the two populations of type Ia supernovae within their host galaxies. Normal velocity (NV) supernovae are found all over their host galaxies while high velocity (HV) supernovae are centrally concentrated and are rarely found beyond 0.7 times the galaxy radius. The results clearly show the two groups have different radial distributions. The normal velocity supernovae are found all over their host galaxies, while the high velocity supernovae are typically found near the centers of their host galaxies and rarely near the edges. Another way to quantify this relation is to look at the fractional flux. This is a measure of the fraction of the total galaxy brightness contained within pixels fainter than the supernova. 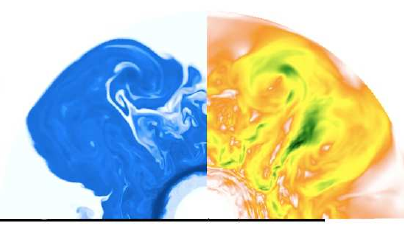 The fractional flux is used to determine whether the supernovae trace the host galaxy light. For the high velocity supernovae, the answer is no. Instead, they appear to occur in brighter regions of their host galaxies. Additionally, the galaxies that host the high velocity supernovae are typically brighter and more luminous than those that host normal velocity supernovae. The original hypothesis that the progenitors of the two supernovae groups are the same appear to be false. But we have learned more than just that: the high velocity supernovae are centrally located in the brightest regions of the biggest galaxies. This indicates a link with metallicity of the progenitors. The metallicity of stars in galaxies decreases radially outwards, and the overall metallicity of a galaxy tends to increase with galaxy size. Therefore, the high velocity supernovae likely originate from a younger, more metal-rich population. I am a graduate student in the Astronomy department at the University of Maryland, College Park. My research interests include exoplanets and planet formation in circumstellar disks. Currently I work on observations of gas poor debris disks, the dusty remnants of the last stages of planet formation. I work with Aki Roberge at NASA Goddard Space Flight Center using mostly space-based observatories to characterize the dust.